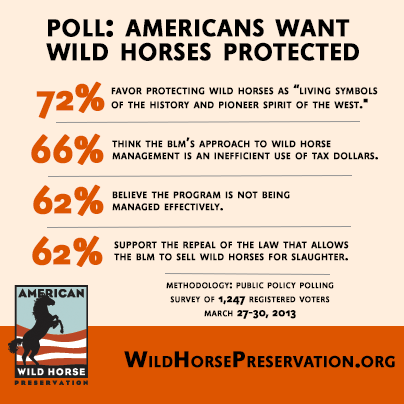 72 percent of Americans favor protecting wild horses as “living symbols of the history and pioneer spirit of the West." The results come as Return to Freedom, the American Wild Horse Preservation Campaign, and allies on Capitol Hill – led by U.S. Rep. Raul Grijalva -- collect signatures on an open letter to the new Interior Secretary, Sally Jewell. The letter asks Jewell to take action to ensure that BLM policy reflects the will of the American people to protect wild horses and burros on the range where they belong. The "Step In, Sally" initiative already has been signed by tens of thousands of Americans including the following high profile celebrities: Robert Redford, Carole King, Ali MacGraw, Viggo Mortensen, Ed Harris, Noah Wylie, Wendie Malick, Betty White, Valerie Bertinelli, Jane Leeves, Laura San Giacomo, Ricky Schroeder, Rae Dawn Chong, David Franzoni (screenwriter; Amistad, Gladiator), Robert Knott (screenwriter, Appaloosa).